“You smell that? You smell that? Some say it smells like hydrogen sulfide but to me it smells like methyl mercaptan. The smell of antitrust law is a combination of old motor oil and wet wool. The smell of divorce law used to be cheap perfume. Now it’s cheap perfume or cheap after-shave. Huh. I always thought that the smell of divorce law was dung . . . from all the crap the parties were flinging at each other. 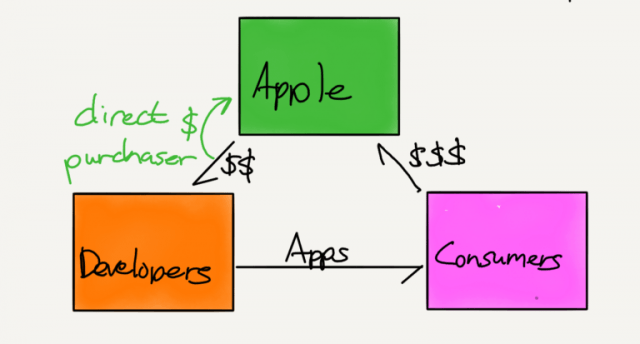 If the developer could get their app to the customer without going through apple – why would apple need to handle (take their cut of) the money? Apple has little to worry about: the decision they’re appealing if from the nutty ninth. Rumor has it that they had 80% overturn rate as of 2010. That second diagram is not at all accurate. Unless you jailbreak your device (an action Apple claims violates your warranty on the device), you are not allowed to install an application package coming directly from a developer. Only applications coming from Apple will run on a stock Apple device. By design, Apple MUST act as an intermediary between developers and consumers in order for consumers to even install or activate apps on their devices.